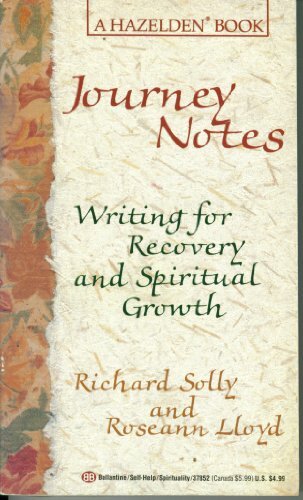 A guide to keeping a journal and using it for spiritual growth uses samples from the journals of great writers to show how a journal can be used as a powerful tool of self-discovery. Reprint. Amazon.com description: Product Description: No matter where we are in our lives, writing can be a powerful tool for reflection and self-discovery. Keeping a journal can be a valuable process for gaining clarity, balance, and honesty, as well as for dealing with issues that are difficult to address aloud. From fiction and letters to stream of consciousness and poetry, JOURNEYNOTES shows how each form offers a special means to self-awareness. With compelling examples from journals kept by literary greats -- from Nobel Prize winners to Anais Nin and Gary Soto -- and powerful testaments of student writers and writers in recovery, these empowering voices help us to explore the varied landscapes of "words that heal."